"Instead of seeing it as a tragedy or a hardship in your past blocking you, it'll be better of your if you somehow flip that around and see it as a challenging for you to overcome and in doing so become stronger than you were before." His run today started at 7:00 a.m. at Camden Yards. Jones has support from local police and many businesses who will be running with him and cheering him on." "I want to be an example of a veteran that went to Afghanistan, had a traumatic experience and was able to come back and find my way in the fight and continue to contribute to America and my family," Jones said. 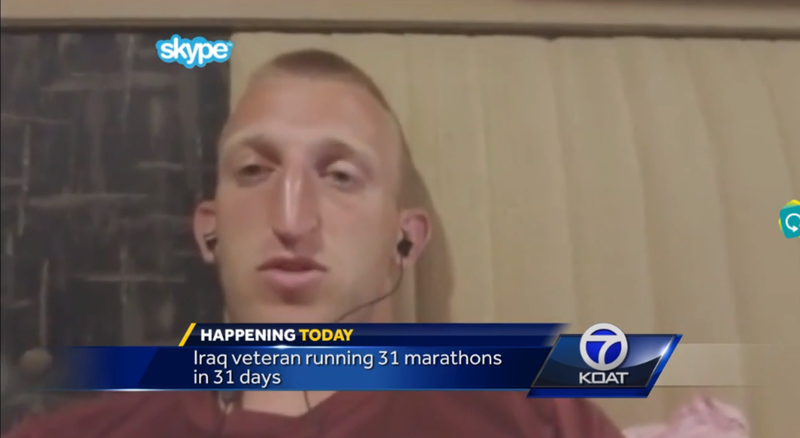 Wednesday morning Jones will run a marathon in Albuquerque. The Duke City is his 21st stop. His next stop after Albuquerque will be San Antonio." 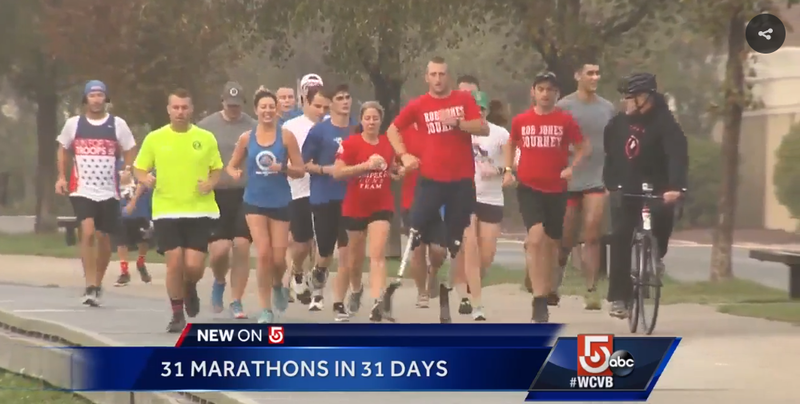 "The marathoner worked hard to recover and gain the use of his prosthetics, where he discovered his talent for running. "You wouldn't expect a double, above-the-knee amputee to be very good at running so I'm just trying to change the perspective as well," says Jones." "On Wednesday, we caught up with Rob on his 14th leg of his multi-city, multi-marathon run in Liberty Park. Fourteen marathons in as many days. It sounds a bit crazy, but he's running with a purpose. "I'm trying to have an affect on an issue in the veteran population where some tend to think that just because you come back wounded, in some way, whether it's a psychological injury or physical injury that you can't contribute to society or stay in the fight." WSLS ABC 10 Roanoke, VA.
"Running is a different beast than biking, Jones said, explaining that his muscles ache, there are skin abrasions on his body, and there's "a dull ache in the background" throughout running. "The biggest challenge is the repetitive stress every day for such a long period of time. It will add up eventually," said Jones. But the pain won't deter him in his mission. "I am doing it for a purpose. The purpose is a lot more important than me being comfortable," added Jones." Jones' mission is simple: raise money for veteran's charities and to lead by example. "I needed to be an example for other veterans and show them that just because you come back wounded in some way, psychologically or physically, it doesn't mean that you can't contribute to society. You're not broken because you got injured," Jones said. 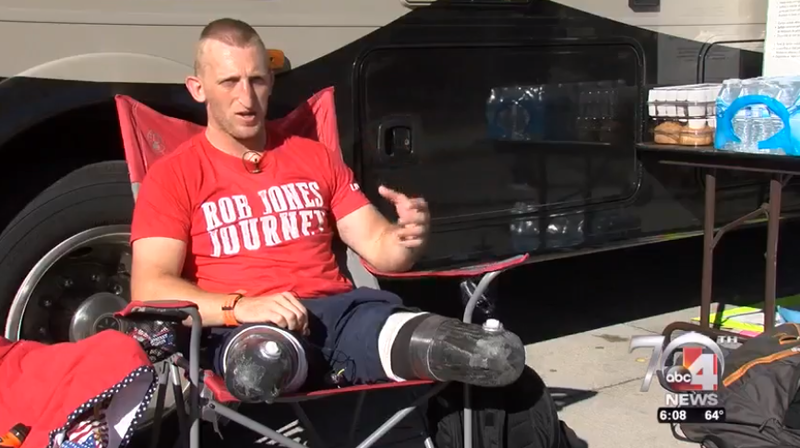 "In 2010, U.S. Marine Corps sergeant Rob Jones lost both his legs after stepping on an IED. Ever since, he has made it his mission to raise awareness for wounded veterans through his work with the Paralympics and nationwide bike rides. 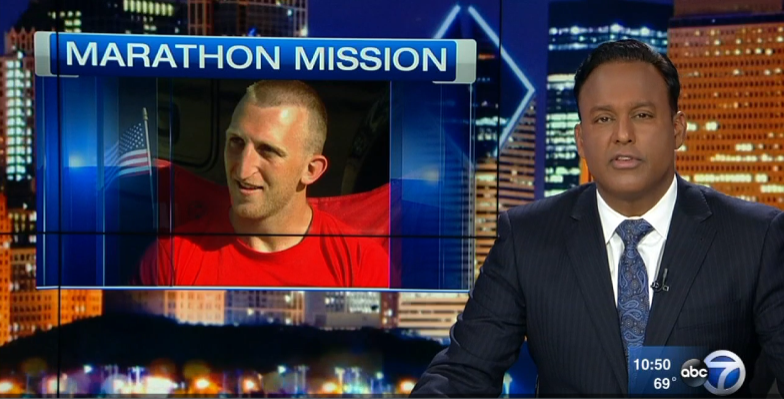 Now he’s taking on his biggest challenge with a month of marathons - 31 marathons across 31 days, in 31 different cities. Learn more and donate at "